Following an unforgettable period of work experience on the shores of Lake Garda, Italy I became naturally familiar with the local customs, cuisine and wine. Of the latter, I guess the customary choice would be a Bardolino house wine, while a Valpolicella seemed to be a stage higher! The recommended wine belongs to a viticultural zone in the provence of Verona, east of Lake Garda. The hilly agricultural terrain is also home to a famous marble-quarrying industry but is most famous for wine growing. Valpolicella ranks just behind Chianti in total DOC (Demominazione di Origine Controllata) wine production. If I remember correctly, a Ripasso wine was chosen to accompany a rich Pasta dish or sometimes a sweet course and as I taste this wine whilst writing I can see why this choice was made. Quite splendid accompanying my wife Alison’s Genoa Cake! In the late 20th Century a new style of wine known as Ripasso emerged in this region. It was created by taking the left-over grape skins and seeds from fermented Amarone for the second fermentation. In short, 90% Corvina and 10% Rondinella grapes are harvested from the steeply terraced hillsides and brought to the winery. They are de-stemmed, crushed and fermented in temperature controlled stainless steel tanks where maceration will last for 10 days. A second fermentation takes place on the skins (or “pomace”) of Amarone and the wine will remain in large oak barrels until bottling. What is all this about? The Ripasso process of second fermentation creates a richness that is lifted beyond a traditional Valpolicella Superiore relising a taste of dried cherry and rich plums followed by hints of mocha and dark chocolate. This is a no-nonsense 14% with a full-bodied palate. There is no doubt that the Ripasso method creates an extra raisin and candied peel long finish. I am certain that few amongst the throng of classical music lovers would shy away from the musical achievements of Johann Sebastian Bach. He can be justifiably proud of moving the Keyboard to centre stage. Amongst the most popular of all his compositions for keyboard, Bach’s Brandenburg Concertos, composed in first part during 1721 were the fore-runners of the keyboard concerto. It was during his tenure as Director of the Leipzig Collegium Musicum in the 1730s, Bach arranged a series of at least eight solo keyboard concertos. I well remember listening to the lovely Goldberg Variations, BWV 988 composed by Bach and was further delighted to be introduced to Parahia’s soloist-conducted keyboard concertos. This Sony performance is typically stylish as well as discreet. The Keyboard Concerto No 1 is thought to be based on a lost violin concerto in D minor. This concerto has remained the most popular of the collection from the 19th Century up to today. Interestingly Mendelsshohn played it and Brahms wrote a cadenza for it. I personally really enjoy the character of second keyboard concerto in E major. It is thought that that this one was based on a concerto for a wind instrument, perhaps for the oboe. Bach initially seems to have used this work for church music. In 1938 he restored the music as a keyboard concerto. The Concerto No 4 in A major has very likely stemmed from an earlier concerto, perhaps again one for the oboe. Bach performed this concerto at least twice, himself once in 1739 and then in 1742. We are often left wondering- did the great composer write these pieces for the harpsichord or the fortepiano? In 1733 a local newspaper from Leipzig reported that “Bach’s group would now feature a “Clavicymbel”, the likes of which has not been heard before”. This suggests that Bach’s keyboard concertos were indeed designed to highlight the fortepiano, still relatively unknown to Saxon listeners. I am often reminded that as I listen and enjoy this music, these are really the forerunners to the later piano concertos of Mozart and Beethoven. What an important development, that would evolve into some of the best-loved music in the classical repertoire. There are a number of recordings of these three keyboard concertos available and Adras Schiff, like Perahia commands a wide range of colours, but I must say I cannot fault the Sony recording. This CD is available from Amazon.co.uk and will certainly inspire the first-time listener to explore more of Bach’s works and perhaps tempt them to try Perahia’s great performances of Mozart. In my earliest days of growing alpine plants I can recall fine plants of this North African Buttercup flowering in the early part of the year, from January onwards. This is such an early-flowering plant that some form of winter protection is essential to protect the beautifully shaped flowers from weather damage. Whilst running Edrom Nurseries I used to grow a marvellous dwarf-flowering selection of this species, given to me by the late Mrs. Sheila Maule, a great grower of choice alpine plants, who gardened in Balerno, Midlothian. She was an authority on the flora of the High Atlas Mountains of Morocco and often travelled there with her husband. The selected plant thrived in a large trough and it was planted in a freely-drained material in a sunny position. In the days of proper winters I would afford this early-flowering species a cloche cover. The habitat in which this lovely buttercup grows is not dissimilar to the recently described Helleborus niger. 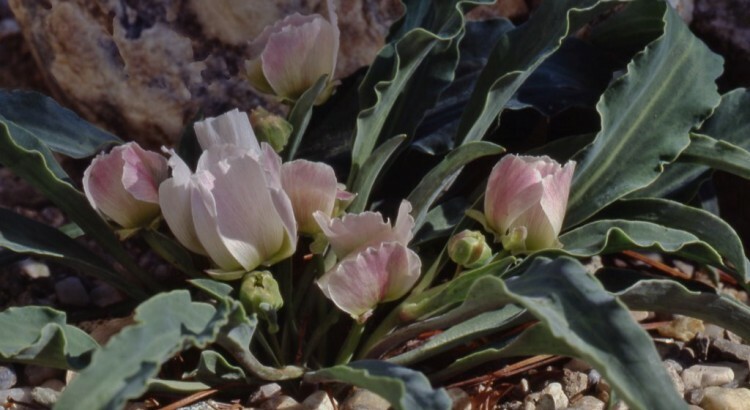 Ranunculus calandrinioides grows in Cedar forest clearings or woodland fringes and on open hillsides. The species seems to have a fairly wide distribution in Morocco from the Rif Mountains in the N.E. and in a more south-westerly outpost. It is a dwarf perennial with typical fleshy roots and glaucous broad foliage often displaying a wavy edge. The flower stems may carry up to 3 flowers, white or flushed-pink in its finest forms. The stems vary in length from 6 to 20 cm and it is in the dwarf end of the spectrum where I am basing my recommendation. Plants may be grown in a deep pot and located in the alpine house or a more natural position in a deep trough allowing the deep root system to travel far in a well-drained substrate. The foliage will die down in the summer and re-appear in December. Propagation can be carried out annually by saving seed which should be sown as soon as it can be rubbed free of its “mooring”. It may well germinate the following spring after a natural chilling. Established clumps can also be lifted (when moist and never when under stress) during the growing season and gently teased apart. Pot up the divisions in deep pots with a gritty mixture and do not allow them to become too damp. To maintain stocks of the lovely dwarf form, division will need to be employed as seedlings will vary in stature. 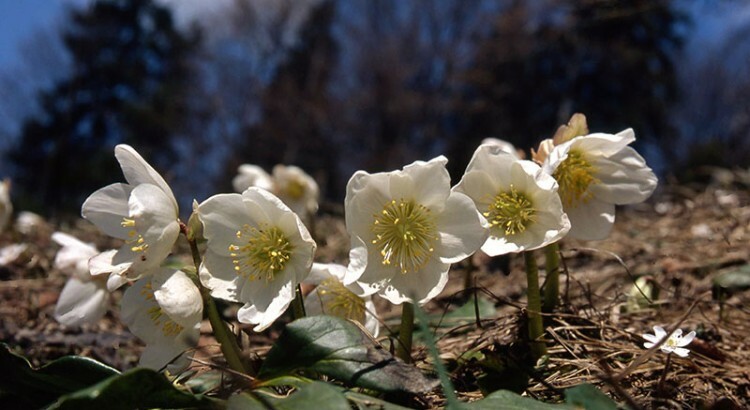 The species was first introduced into British gardens in 1929 and it received an AM in 1939. For my wife, Alison and me, a real treat is to go out for a meal to our local Italian restaurant, the award-winning Osteria in North Berwick. To accompany our recent meal we chose a Pecorino wine, a grape we were hitherto unfamiliar with. I was accused of getting confused with the well-known Italian, sheep’s milk cheese! The owner soundly recommended the wine and, following the meal, we both decided that it would remain a firm favourite amongst our many preferred Italian white wines. Having carried out some research into this grape variety, I was interested to note that it produces rather low yields in the region where it prevails (by comparison with the Trebbiano grape), which rather unsurprisingly makes it less popular among winegrowers. However, because of its ability to ripen early and its complex aromatic “nose”, it has earned a continued presence in the vineyards of the Abbruzzo and Marche regions. My recommendation is chosen with availability in mind and may be purchased from Tesco. There are a number of fine Pecorino wines available from alternative supermarkets and also from the splendid emporium for Italian food and wine, www.valvonacrolla.co.uk, but I have not yet tasted them. When tasting a wine I am often surprised or captivated by its colour and this was very much the case with my first experience with the Pecorino grape. Its straw-yellow colour suggested some aging but this was not the case as it was a relatively young wine. The floral bouquet suggests acacia and jasmine while the first taste hints of pear, and citrus flavours. I picked out something less easy to determine with my first tasteing and that may have been a suggestion of licorice. Although I have not yet accompanied this wine with the Pecorino cheese, I am led to believe that this works really well as an accompaniment. I have to say that a match with local seafood was quite special and I would whole-heartedly recommend this combination. It is disappointing that relatively little is known about the classical Czech composer Neruda. It is recognised (Wikipedia) that he lived from c. 1708 to 1780. He was born in Bohemia to a well-respected music family. Following his early years as a violinist and conductor in Prague, he became Konzertmeister in the Dresden Court Orchestra. His composition output includes 18 symphonies, 14 instrumental concertos, sonatas, sacred works and an opera “Les Troqueurs”. One of my absolute favourite pieces of trumpet music is Neruda’s Concerto in E flat for Trumpet and Strings. It was originally written for a natural horn but is now performed almost exclusively on an E or B flat trumpet. I had the privilege of hearing this work performed in the breathtakingly beautiful Baroque, Steinhausen Church of Pilgrimage in Baden-Wurttemberg, Germany. Such was the perfection of natural acoustics, I could feel every tone of the trumpet and had to muse over a conflict between the beauty of the composition and the artistry of the performer! This is a marvellous piece of music. From time to time in the history of modern alpine gardening, an artificial hybrid of outstanding beauty is created either by chance or by careful hand-pollination. 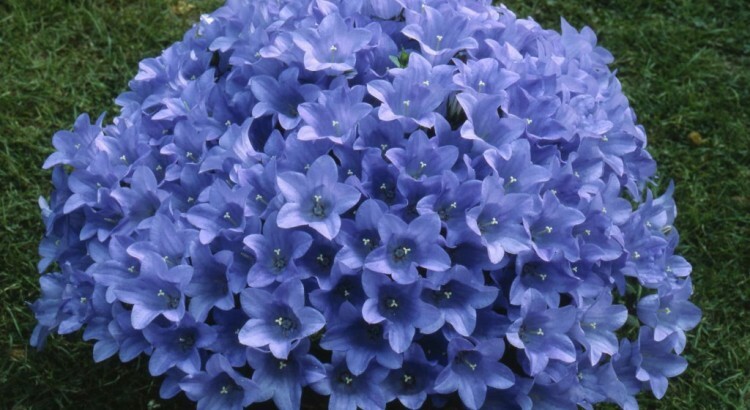 Many of the finest plants are created by chance and it was by this method that one of the finest of all hybrid campanulas was raised. Of greatest concern are the number of wonderful hybrid plants that have fallen by the wayside, however the plant under the spotlight was raised in the 1970s at the famous Broadwell Nursery in the Cotswolds, England and still thrives in alpine plant collections today. The hybrid arose when a passing bee transferred a dollop of pollen from Campanula raineri and deposited on the ripe stigma of C. morettiana, a distinct seedling was spotted, with its shallower flowers and typical C. raineri leaves. Once isolated it grew vigorously (a sure sign of hybrid vigour) and in its second year flowered continuously from June until September. What a discovery and what sharp eyes were the possession of the late Joe Elliott and his nursery manager Ralph Haywood. So Campanula ‘Joe Elliott’ was created, commemorating its raiser. The hybrid has the same running habit as C. raineri and can therefore be propagated, both by division and cuttings of non-flowering stems. Plants can be grown in a trough or raised bed and are best given cloche cover during the winter wet. Both parents enjoy an alkaline substrate in nature and the hybrid will respond to a material with added tufa or dolomite granules. I must emphasise the need to be vigilant against the visit of slugs at all times, they love expensive campanulas! This outstanding cultivar has been awarded as a plant for exhibit, an A.M. in 1978 followed by the coveted F.C.C in 1981; a real accolade. The Italian composer Gioachino Rossini lived from 1792 to 1868, born in Pesaro and is of course best known for his operas, including The Barber of Seville. In 1806, at the age of fourteen, Rossini was given the opportunity to study Counterpoint (the simultaneous combination of two or more melodies to make music) in Bologna. During the next four years he composed various instrumental works, mainly overtures and variations. While I have always loved listening to his overtures, I really enjoy these Six String Sonatas for two violins, cello and double bass. I find these pieces quite charming, fun and so easy to listen to when the mood for a heavy Symphony or thrilling Concerto is unwelcome. The composition for four instruments displays real assurance and the wit and melodic fluency is clearly evident. All six Sonatas are in three movements. The first movements are in a simplified version of sonata form, with secondary themes that extend the first subject. The slow movements are mostly operatic arias in instrumental guise with the first violin being the soprano soloist. Four of the finales are in rondo form and certainly full of Rossinian wit and sparkle, where as that of No 6 a Tempesta – a storm scene, which was to become a familiar ingredient in Rossini’s operas. Nowadays, when these Sonatas are performed, they are usually played by a string orchestra and a recording by single strings (as per my recommendation) is a rarity to be cherished. As readers listen to these sonatas I am sure you will appreciate that Rossini was an accomplished singer, they a delight to be enjoyed. I have to say that this Soave has always been one of my firm favourites, a truly fine wine from this celebrated region of Veneto. This is an area steeped in history, with the Garganega grape, from which this famous wine is made, being first planted here by the Romans. The Inama estate, which I am highlighting was founded in 1960 and is owned by Stefano Inama today. Their Classico wine is grown on some 25 hectares of basaltic lava substrate and the grapes are hand-harvested then fermented in stainless-steel vats with 8 months maturation prior to bottling. For me, this wine delivers an elegant nose reminiscent of meadow flowers with an exquisite taste of apricots, honey and almonds. It is light-yellow in colour and has a rich texture with an elegant finish – quite superb. I can happily enjoy this wine as an aperitif but would choose to enjoy it with some fine, locally caught and prepared Sea Bass or a flat fish. This is certainly a wine to savour, however it may require some diligent search from a local wine merchant.